Greetings from Mt Washington Valley! We’re off to an amazing start of the ski season in Mt Washington Valley, and we’re only on day #2 of winter officially! Mt Washington Valley’s ski resorts and XC Centers are open and offering primo conditions with new snow just about daily. Today’s snowfall, combined with 7” of natural snowfall over the past week means that we go into the Christmas vacation stoked for an amazing holiday for skiers and riders. Even Santa did a little product testing and give us a thumbs up for Christmas week. 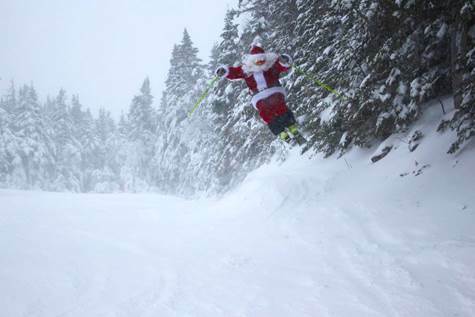 Attitash – 23 trails, 23 groomed runs, 5 lifts operating, 100 acres of skiable terrain. Base depths: 10”-22”. 1” new snowfall in the past 24 hours, 8” new snow in the past 7 days, 23” total this season. Snowing presently, 1”-3” new snow predicted for today. Black Mountain – 11 machine groomed trails, 2 lifts operating, 45 acres of skiable terrain. Base depths: 12”-24”. 14” of snowfall for the season. Bretton Woods – 21 machine groomed trails, 6 lifts, 138 acres of skiable terrain. Base depths: 12”-36”. Snowfall in season to date: 48”. Light snow falling, with 1” to 3” predicted for today. Cranmore – 17 groomed trails, 3 lifts, 73 acres of skiable terrain. Base depths: 18”-24”. 1” to 3” of new snow predicted for today, 7” of new snow reported in the past 5 days. Cranmore Adventure Park re-opens this weekend. King Pine – 9 trails (100% groomed), 3 lifts operating, 40 skiable acres skiable terrain. Base depths: 24” – 36. 7” new snow in the past 5 days, 18” snowfall to date. It’s presently snowing with 1”-3” of snowfall accumulation expected. Shawnee Peak – 16 trails (15 groomed), 4 lifts operating, 1 terrain park open. Base depths: 10”-24”. Light to moderate snow predicted for today. Wildcat–14 trails (14 groomed), 2 lifts, 96 skiable acres. Base depth: 25”-55”. 7” of snowfall in past 7 days, 5” of snowfall for the season to date. Presently snowing with 1”-3” accumulation expected today. The XC Ski Centers in Mt Washington Valley are all anticipating opening in December with opening dates totally dependent on weather. Bear Notch Ski Touring – 10km classic, 10km skating on Waterfall Trail, experimental Forest Trails, Albany Brook Trails, Upper Saco River trails, Lower Fields and Upper Meadow. Base depth: 6”-12”. Light to moderate snow predicted for today. Bretton Woods Nordic Center –21 trails/36.6km 21 trails skate groomed. Base depth 2”-4”. 5” of new snowfall within the past 6 days. Snowfall to date: 48”. Great Glen Trails – 45km open with 15km of skate groomed trails, 6km tracked, 45km of snowshoe trails. Average base depth 4”. 10” of new snow in the past 7 days; 22” of snowfall to date. SnowCoach is running. 3”-4” of new snow predicted for today. Jackson Ski Touring Foundation – 35 trails (62.7km), 34 trails tracked and skate groomed. 18 trails open for snowshoeing. Base depth: 5”-11”. 6”-7” of snowfall in the past 4 days. 21” of snowfall reported to date. 1”-3” of snow accumulation expected for today. Mt. Washington Valley Ski Touring – 40km open in Whitaker Woods and Intervale Loop, 45km open for snowshoeing, 2km open for fat biking. 34km single tracked, 40km skate groomed. Base depths: 6”-10”. Snow expected for today. Purity Spring XC and Snowshoe Reserve – Scheduled to open on December 26, 2016. · Low clouds over Cranmore: A neat shot of clouds hovering at the base of Cranmore taken 12/20/16. Photo credit: WiseguyCreative.com. · Skiers take to perfectly groomed trails at King Pine: Primo conditions for opening week at King Pine Ski Area. Photo taken 12/21/16. Photo Credit: WiseguyCreative.com. · Skiers smile for the camera at Bretton Woods: A bluebird day for skiers at Bretton Woods. Photo taken 12/21/16. Photo credit: Bretton Woods/Omni Mount Washington Resort. And the award for Best NH Maple Syrup goes to..